Overgrown grass and weeds, junk, and rat burrows in the backyard. A pothole that was previously filled has become super deep again due to rain, snow and people driving over it. The road is always wet near the pothole even when it hasn't rained, I think there is an underground issue related to the pothole. 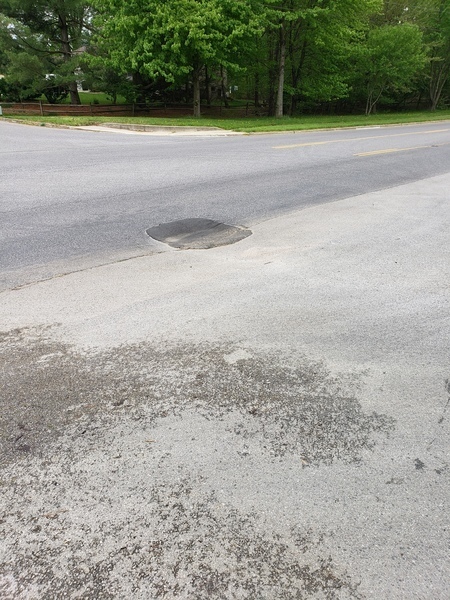 Thank you for contacting the Department of Public Works, Bureau of Highways regarding your pothole concern. Work order # 19412091 has been created and assigned to the Central District Road Operations for investigation and repair. Should you need additional information on this issue please contact (410)222-7940. Peaches is an orange Tabby that was outside this morning. She did not come back in the afternoon. Car has flat tire and has not moved for some time. Water from Clark Station Road drains through 1224, 1222 and 1220 Bradley Road directly into a conservation area within the Cottonwood Community. Without a storm water drain at this location the pollutants from the road are running through these properties and allowing the water to stand in the conservation area. The water that is left standing in this conservation area is killing the once established trees. These trees were once thriving and due to the improper draining of the roads runoff water have been left to die. I noticed that the drain under Bradley Road that connects this conservation area to the retention pond on the other side of Bradley Road is too high to allow the water to properly drain into the pond. The trees prevent the water from evaporating, and also causes a bad mosquito problem. The water from the conservation area does not drain into the waste water management pond. If it gets high enough it will go to the other side of the street, next to the pond. Only water from the storm drains go into the WWM area. My concern is that the low spot next to the storm drain allows water, with pollutants, to run through the back of lots 1224, 1222 and 1220 Bradley road. The county made the builders re-grade these lots because they had flooding in these backyards. All that water remains in the conversation area for extend periods of time. And over the last 4 years has killed many of the trees in the area that do not have the root systems to survive. There are also abundant amounts of algae in the conservation area from the road pollution. I do not understand you the conversation area has to hold so much water but the WWM ponds in the area hardly seem full. Additionally, we have all this standing water but can never get on the county mosquito spray list? I had put in a complaint to the MD Dept of Ag Mosquito Control since the county didn't care...but they didn't do anything. I even mentioned the tiger mosquito. The guy they sent out seemed really confused. It's not just all those trees dying, with it staying so wet back there all the time there's higher chances of all those trees falling down when we get the wind storms. My water got shut off today, I wasn't paying attention and let it slip for too long which was my fault, I just paid my bill in full and was wondering what else I need to do to get it turned back on? Thank you for contacting the Bureau of Utilities. Can you please provide me with your confirmation of payment number and I can send a member of our staff out to turn on your service. Thanks for getting back so fast! They have a Monte Carlo parked on their private property that is not tagged and an SUV not registered, and appear to be inoperable. The Monte Carlo was on the private community road and pushed to the owners townhouse to avoid being towed. However, per HOA rules and anne arundel zoning rules they do no allow untagged vehicles in the neighborhood but the towing company said they aren't allowed to tow a vehicle off of private property. Could you please get this vehicle removed from our community. Thank you for your request. On April 9, 2019 place your empty 65 gallon container curbside no later than 6:00 am to be exchanged for a 95 gallon container. Should have additional questions regarding this request, please contact our Customer Service Department at 410-222-6100, Monday – Friday 7:30 am - 4:00 pm. Important Notice: The 95 gallon will not be left if the 65 gallon is not curbside to be exchanged. Container exchange will be completed during the hours of 6:00 am to 3:00 pm. This household has had this situation with their mailbox for several months now. I cannot imagine it meets postal standards. I cannot seem to catch the residents at home, and don't want to simply leave a note on their front door. Is there some tactful way they might be approached? Thank you for contacting the Office of the County Executive. We suggest a nice baked good and a very tactful but frank conversation in person.